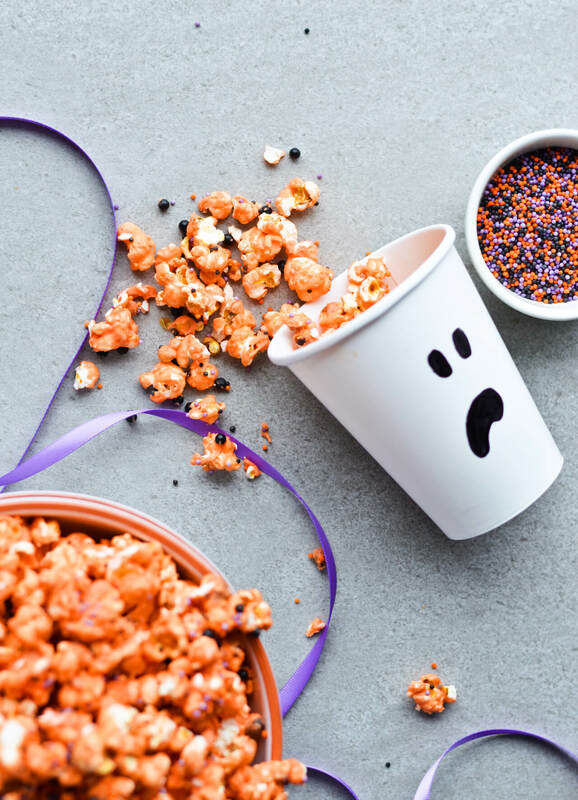 Tis’ the season for scary movies and White chocolate Halloween sprinkle popcorn! Halloween is less than two weeks away! Is anyone excited? I really wish this was a bigger thing here, I’d love to see little pumpkin lanterns scattered around town. I think that would be really cute. But I am in full Halloween mood, both with candy and movies. One of our TV stations played Psycho over the weekend and it’s been so long since I last watched those movies. I really like watching old classics, I just prefer that style over the HD situation we have going on now. Not that I don’t like new movies. But there’s just something about the old ones. Speaking of Psycho, I am still a little behind on Bates Motel which is perfect because I feel the weather is now finally perfect for a show like that one. I wonder how many of you are dressing up for Halloween. Whatever you do, I just hope you don’t go out dressed as clowns. Are you up to date with the clown craze? It seems like everytime I Google the term, more crazy news pops up. I mean, I was a clown 2-3 times when I was little and went trick-or-treating during the Slovene Carnivals. My mom made my costume, so I was a cute clown. But I generally don’t like clowns, they freak me out. I think working at McDonald’s a decade ago didn’t help my situation either. From what I’ve seen this clown thing started in the USA. Some believe it’s just promo for the 2017 release of IT. I really like the original and I do wonder what they’ll do with the remake, but once you have clowns running around with chainsaws or knives, that’s more than just guerilla marketing, right? This epidemic is probably completely unrelated to IT and it has now spread, as far as I know, to Ireland, UK, Australia and definitely Slovenia. They reported of some clown sightings on the news and the police are on top of it, urging everyone to just call it in if we see anyone. Luckily I haven’t seen a clown yet. And I hope I don’t. If I have to choose, I prefer clowns on-screen. If you have never seen IT, now is a good time. And I think I’ll rewatch it too. With popcorn! Here’s the 1990 trailer, for anyone interested. 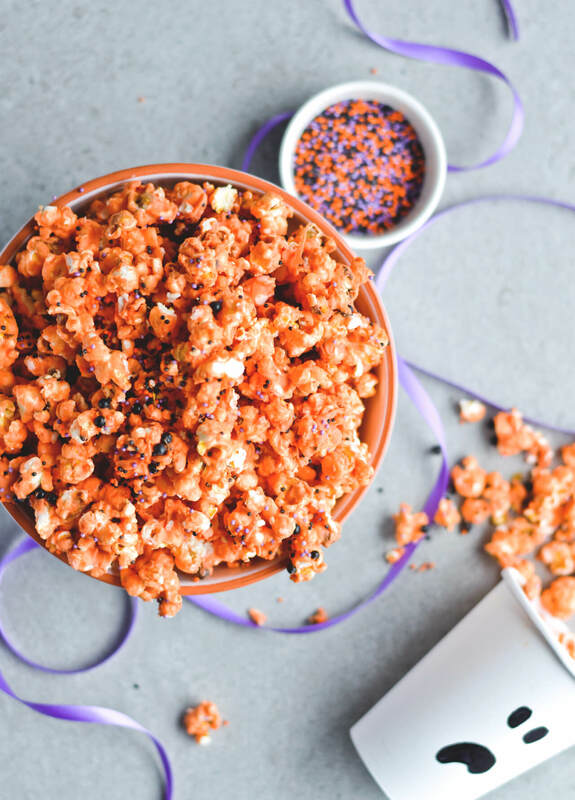 I do already have a popcorn recipe here on the blog, but I just wanted to make some orange popcorn. 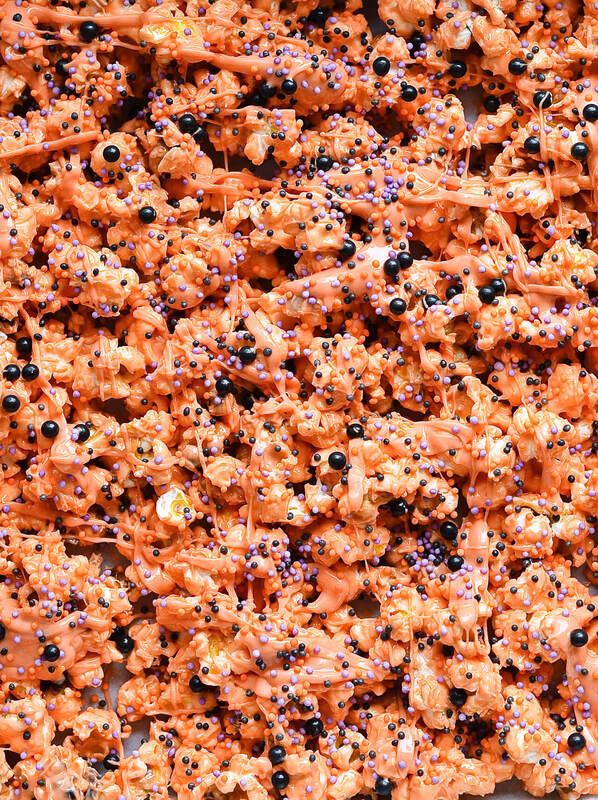 With my new Halloween sprinkles. I was stocking on some holiday sprinkles and I just couldn’t pass on the Halloween ones. You can’t really have too many sprinkles, can you? 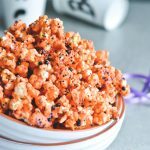 This white chocolate Halloween sprinkle popcorn is really easy to make. I like to make popcorn at home, but you could easily skip this step and just buy a bag of unsalted popcorn. And then all you have to do is melt the chocolate at home, have fun with sprinkles, lick the chocolate covered spoon in the end. The latter is a must. Let me know if you have any favorite Halloween movies! And snacks! Besides popcorn, of course. 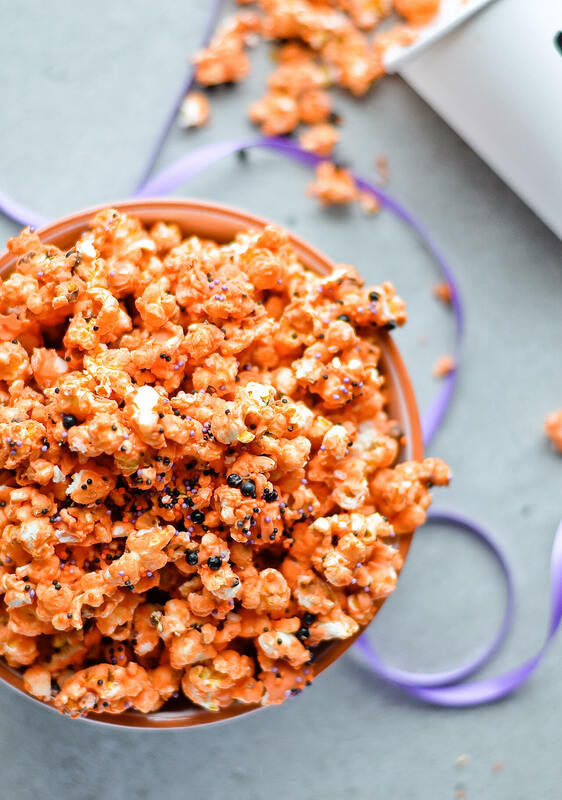 Fun, chocolaty twist on popcorn! Recipe makes one medium bowl of popcorn. Place 4 kernels and 2 tablespoons coconut oil in a large pot, cover it with a lid. (I use an enamel pot with a glass lid.) Set over medium-high heat. Once the kernels pop, quickly lift the lid and toss in the rest of the kernels. Shake the pot to evenly distribute the kernels, wait for them to pop. Once they begin popping, shake the pot occasionally, until the popping slows down to about 3 seconds between each pop. Immediately remove the pot from heat, remove the lid and transfer popcorn into a large bowl. Remove any kernels that have not popped. In a heatproof bowl, placed over a pot of simmering water, melt the chocolate. If the water starts to boil too hard, remove the pot from heat for a minute, then put it back on. 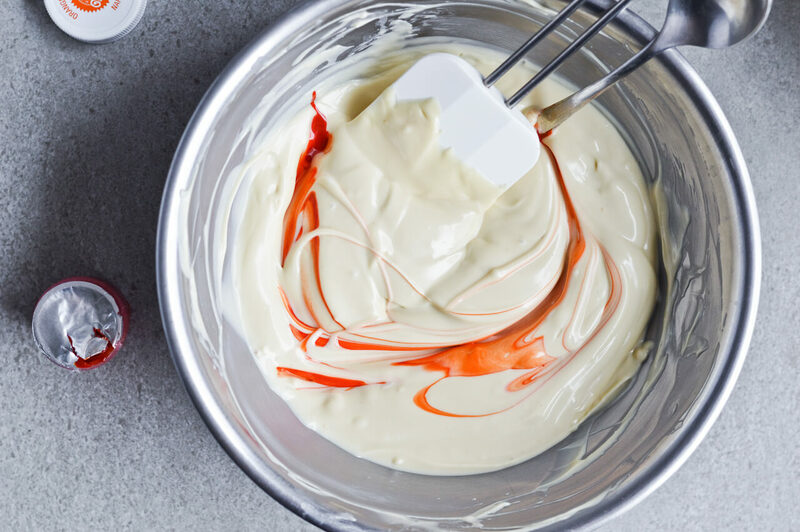 Stir occasionally with a spatula. Remove bowl from heat when most of the chocolate is melted. 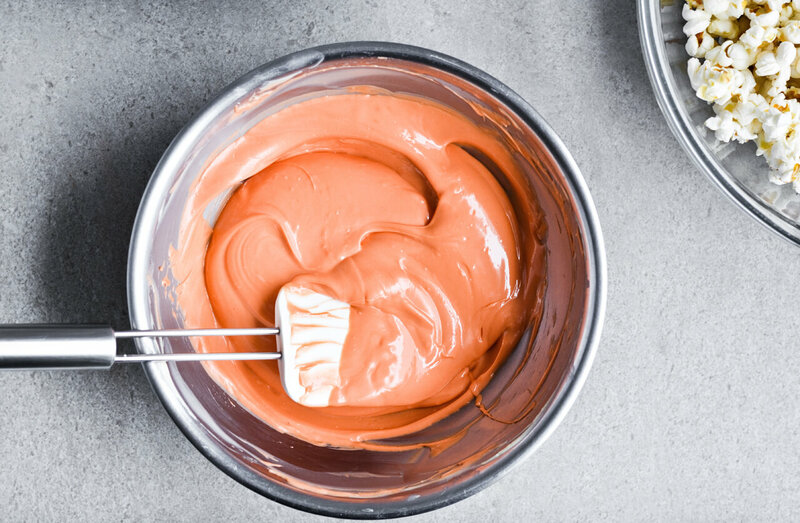 Let it melt completely then add food coloring, as much as you want to get the intensity of the color you’re looking for. If the chocolate isn’t very pourable, add some coconut oil to thin it out. 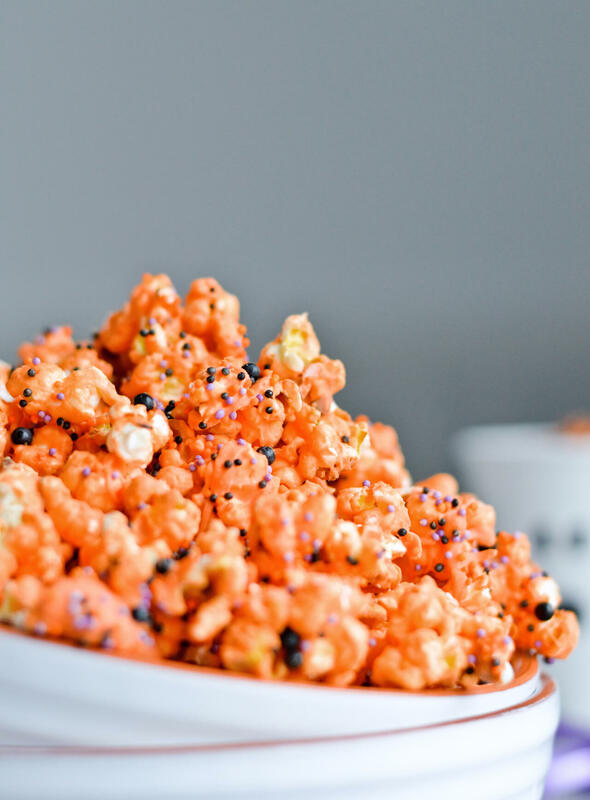 Pour 1/2 of the chocolate over popcorn and stir with a spatula until all popcorn is coated. 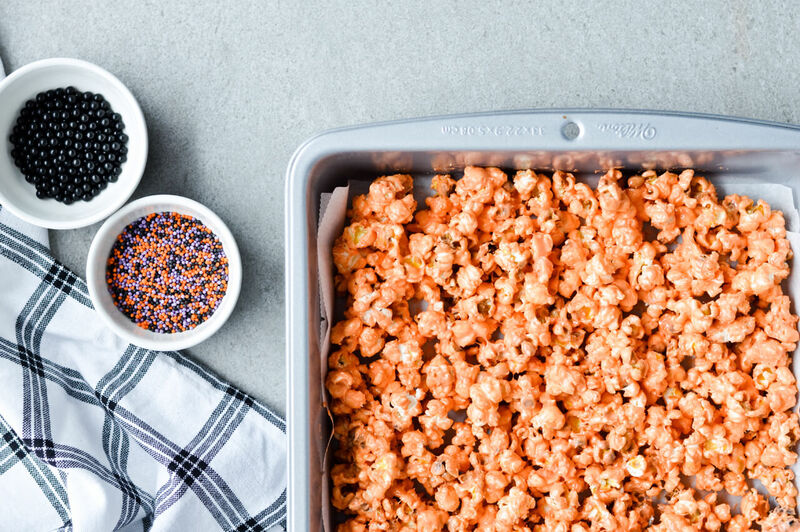 Transfer popcorn to the baking pan, in a single layer. Drizzle with more chocolate, then sprinkle with sprinkles. Place in the fridge for at least 15 minutes. Once chocolate has hardened, remove pan from the fridge and transfer popcorn to a large bowl. 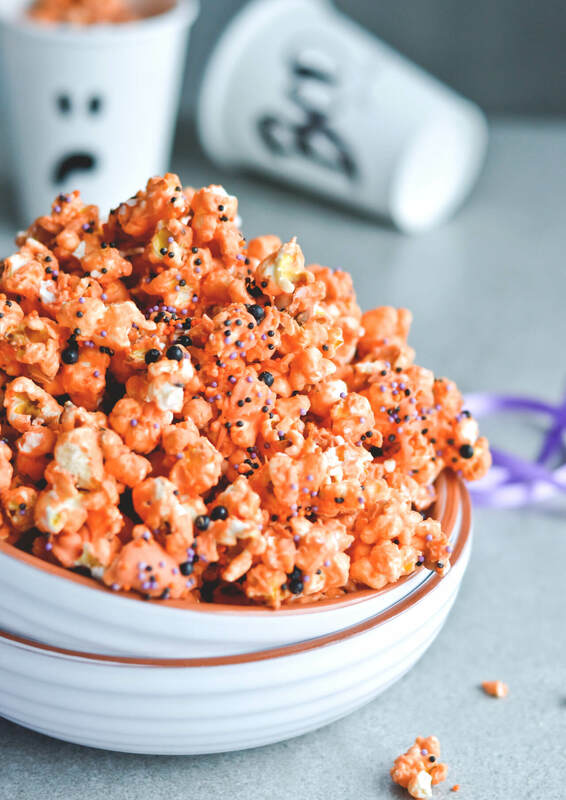 Break any popcorn clusters created by the chocolate. 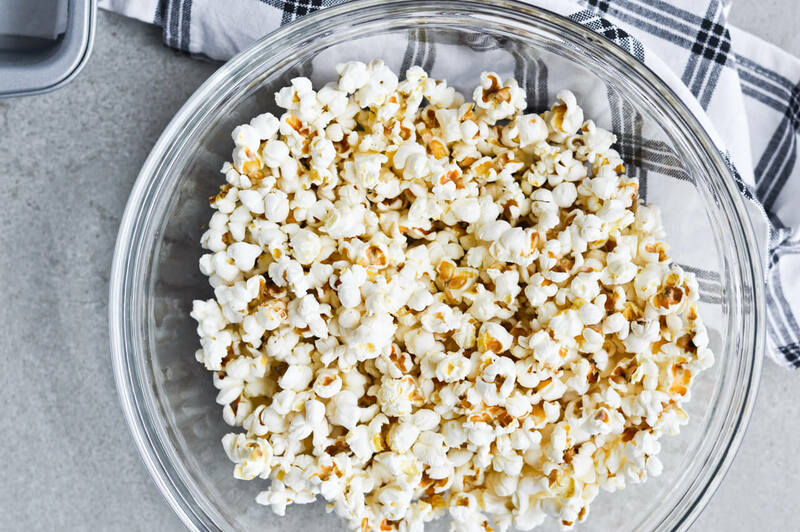 QUICK TIP: If you don’t have popcorn kernels or don’t want to make popcorn at home, you can easily buy unsalted popcorn at the store and simply do the chocolate part at home.